A Powerful Commercial Air Purifier System for Chemical, Particle, Smoke & Odor Removal in Large Spaces, with Heavy Duty 8 Stage HEPA and Pre-filter System, Optional Activated Carbon, HVAC Mountable, Positive and Negative Air Scrubber Capable, with 5000 CFM Variable Speed, Portable Cart Option and Up to 15,000 Square Foot Coverage--All at a Discount Price with Free Shipping! 5000 CFM--Industrial-Grade Airflows for Extra Large Rooms, Warehouses, Etc. Refillable Carbon Canisters---save 30-40% on carbon filter changes with bulk carbon! Got big high levels of airborne pollutants that need to be removed from a large commercial room, warehouse or workshop? Need an air filtration system strong enough to attach to a commercial air conditioner and clean all of the air in a building? 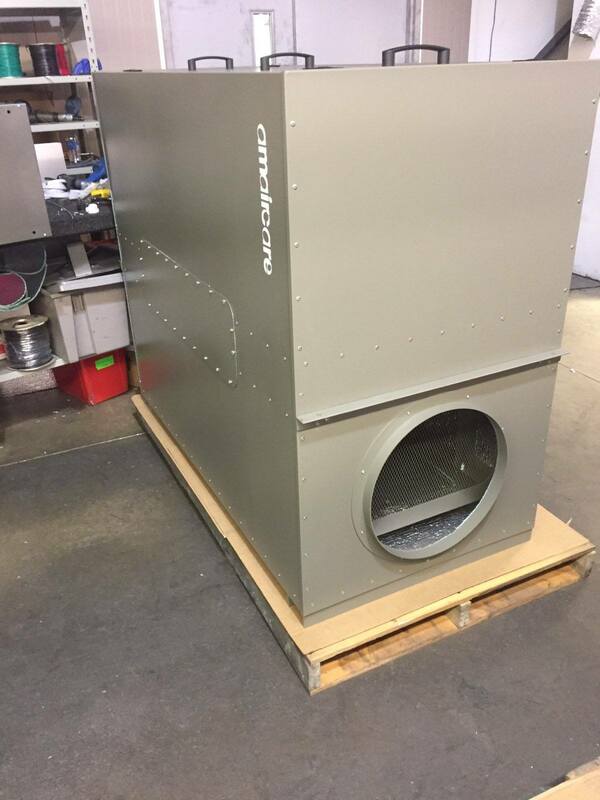 The Amaircare 5000 Custom is one of the best, most versatile industrial air cleaner systems on the market, with an affordable price, 5 year warranty and fully customizable filter configurations to quickly and effectively remove large and sub-micron size particles, fibers, smoke, chemicals and odors. The standard CS 5000 unit features a full 5000 CFM, 8 HEPA fitlers and 8 pre-filters for maximum particle removal in a large space, all with relatively quiet operation. For smoke or smoke odor removal, 8 - 7 lb standard carbon or Formaldezorb (FZ) inserts can be added for HEPA and carbon filtration simultaneously. For extra-heavy smoke or other organic chemical odors, the 8 HEPA filters can be substituted with 8 - 30 lb refillable standard or FZ carbon canisters, for a total of 240 lbs of quality carbon. Special carbon blends are also available for specific chemical or odor removal not covered by standard or FZ blends. The unit can easily operate as a direct to room ambient air cleaner, clearing the air and keeping it clean in a large room or it can attach to central air conditioning or other ducted connection such as positive or negative air. The Amaircare 5000 Custom is can also be made portable by adding the cart option. All in all, the 5000 Custom is a very versatile, powerful commercial grade air cleaner that will remove almost any fume, odor, particle or other pollutant from a large space or HVAC system. 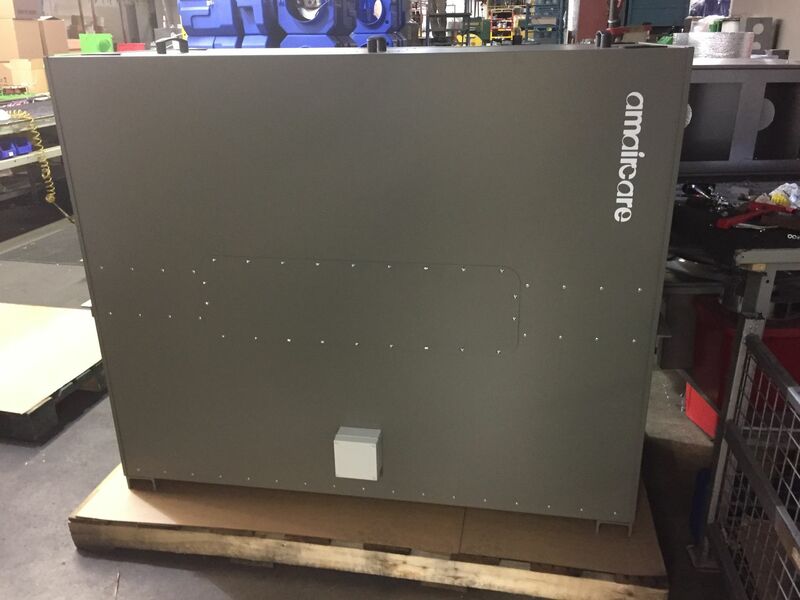 Order your Amaircare 5000 Custom here at a discount online sales price and feel the difference that a high-quality enhanced carbon and HEPA air cleaner can make! There are not many official online retailers of Amaircare air quality products and unfortunately the internet is full of scams. As a general rule of thumb, if the deal seems too good to be true, it probably is. Cheap cut rate online deals often end up being a used or refurbished unit, which do not come with Amaircare's top rated 5 year warranties. Or even worse, you may end up buying a cheap discount air cleaner that doesn’t have the energy efficiency, features or real air cleaning power provided by top-rated Amaircare air filtration systems. 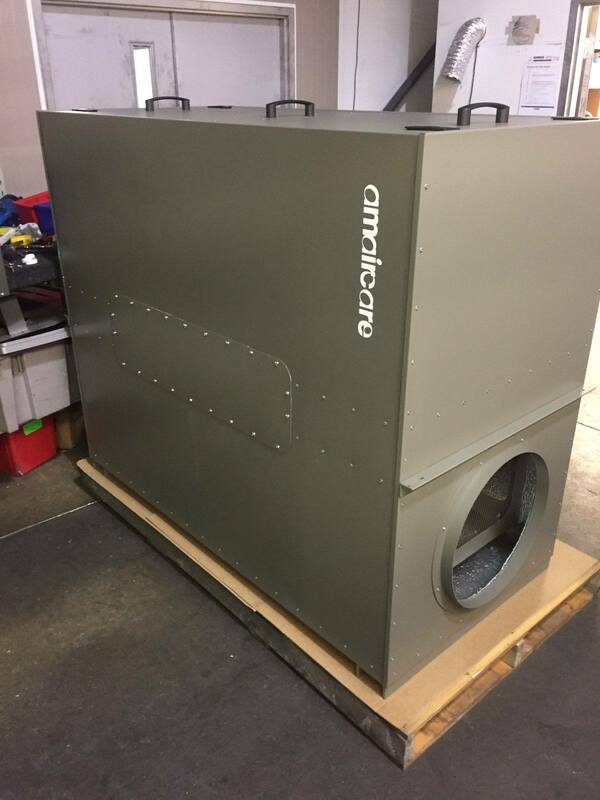 When you buy your money and energy saving Amaircare air filtration products from us, you get a brand new unit, at the best possible price, with Amaircare's 5 / 5 warranty. Our innovative partnership with Amaircare allows us to ship directly from their warehouse, which cuts out the middle man and eliminates the high operating costs of traditional brick and mortar big box stores. These savings get passed directly to you, allowing us to offer brand new allergy and asthma symptom-eliminating Amaircare air purifiers and filters at the best possible everyday cheap discount online sales prices. And buying from us is definitely better than direct. If you buy direct, you'll have to pay shipping. Buying from us, however, you always get fast free ground shipping as our thanks to you for shopping with us. 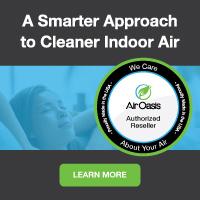 If you have any questions give us a call or send us an email and one of indoor air purification experts will be happy to help! Add 8 - 7 lb Standard Carbon Canisters? Add 8 - 7 lb FZ Carbon Canisters?